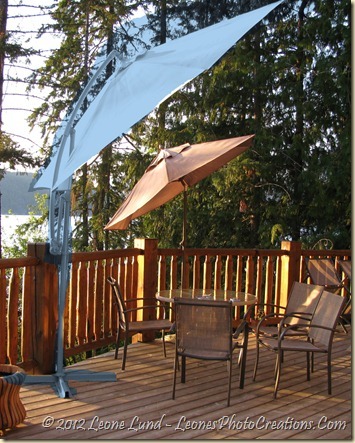 The 2012 Olympics are on and everyone’s wound up in the excitement – including our patio umbrella apparently. Guess it felt left out, or ignored, or maybe it’s practicing for the 2016 Olympics. Whatever it’s motivation it decided to vault over the railing. My husband and I were inside the house when we heard an ungodly rumbling from our patio – like someone moving all our patio chairs and tables; my husband watched in fascination as the shadow of the umbrella slowly tilted, then disappeared over the railing. Turns out it was not properly secured and it just leaped over the railing to a rather ignoble pile of metal and canvas on the ground below. I gave it a Gold Medal. It did not scrape the railing going over, did not tip over or break any tomatoe plants, missed the plant pot below – and the Jeep! No one was injured – the umbrella itself did not even suffer any damage! The only mishap was one plant sitting on a small table which went upside down and the plant was unceremoniously dumped on its head. All I had to do to restore it’s dignity was pop it back in its home and give it a drink. I’m sure it needed one after that shock! So, even though my husband and I are not Olympians, we have a patio umbrella that gave it it’s best shot!